Mike Yorwerth, global technology and architecture director at Tesco, plans to slash the carbon footprint of the supermarket giant's IT by 50%, while at the same time, use IT to turn Tesco green. The company has asked Intel, HP, Microsoft, Cisco and other big providers where they are going in terms of technology and how they can help to reduce its carbon footprint. "We also are looking at where we will be using more technology in the future. It's a careful balancing act and we know we've got to keep on ensuring we put in place those controls to make sure that we make the right decision every time," he says. Yorwerth started the programme a couple of years with the goal to reduce the carbon footprint of IT by 2020 by 50%. He also set the target of how IT could be used to tackle carbon emissions in the rest of the business. "If I look at IT as a proportion of the carbon footprint of Tesco, it is of the order of 2%-3%, but it plays a role in reducing the carbon footprint of the other 98%," he says. Technology can play right the way through the supply chain, for instance, by providing better forecasting information to suppliers. "They produce and ship less to the distribution and supply chain and we store and ship less to our stores so that we get better transportation and routing." Within stores, Yorwerth says, it is possible to use IT to monitor the store environment. "About the biggest energy users in stores are things like refrigeration and heating, ventilation and air conditioning. By treating these like IT systems, we can start to understand where they're working out of tolerance, using more energy than they should be or whether somebody has left the lights on." The first step was to recognise that IT can have both a positive and an negative impact on the carbon footprint. Yorwerth began by defining the problem because Tesco needed to understand and measure IT's contribution to the company's overall carbon footprint. "This is not a simple task to do. It involves a bit of bottom-up testing of physical equipment and seeing how it responds and a bit of top-down to find out how much the datacentre uses." Since IT is a continuously evolving environment, Yorwerth uses carbon controls, which are used as projects come in to measure their potential carbon impact. "We look from the architecture, design and infrastructure points of view to see how we can minimise the carbon footprint of a particular project or programme. We measure it and set a kind of carbon budget for the year for the department." Tesco is running a significant investment programme to replace its tills in a bid to lower its in-store carbon footprint, by moving to a lower energy-use infrastructure, The company has just gone live with electronic shelf-edge labels, using bi-stable shelf-edge labels, that only require power when the price is changed. With electronic shelf-edge labels, Yorwerth says, "I save an awful lot in printing costs, in energy to print, in toner and in paper." Additionally, Tesco is using natural refrigeration in its fridges, which are environmentally friendly. Behind the scenes, he says, refrigeration, lighting and heating are managed centrally rather than locally, all of which helps to tackle in-store carbon emissions. A big proportion of in-store IT carbon emissions is the checkout. "We work with Wincor Nixdorf and NCR on how we can both reduce the carbon footprint of the devices themselves as well as the software side." 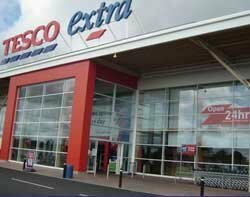 Tesco is also working with software firm Retalix to automatically control the energy management of the tills. Yorwerth is looking forward to being able to switch them off and on remotely using the company systems management software, from CA. "I don't think going green needs to be a big investment and actually it's more about an attitude and approach. This is why we started it. When I look at green IT and specifically within IT we started it as a lean six sigma programme." He admits that, in the past, IT was terribly inefficient. Prior to server virtualisation, server utilisation was of the order of 2%-5%. "A server that was on average utilised about 10% was probably quite busy actually, but that's terribly wasteful." According to Yorwerth, in most organisations, the IT group has no real understanding of its energy use. "If you start initially to talk about energy use, people get their heads around the benefit." One clear win for lowering carbon emissions is print. At Tesco there were numbers of printers in each department. Users would print a document off, and forget to pick it up. Then they would print another copy. "By removing all the printers, you take that ease of printing away from users. People think about printing. Now people go up to a printer, they swipe their badge and it's only then that it prints off. It's a very quick and simple change," Yorwerth says.